I rushed home from work after watching the second tower fall to the ground live on TV. I felt compelled to pick up my then one-year old son from the pre-school he was attending as if having him near me could keep him safer from these acts of violence. Laura worked in the same school but I felt I needed to bring him home anyway. I watched hours of coverage throughout the day – I was and still am a news junkie so I needed more information. I couldn’t stop watching, listening and reading well into the evening. I don’t remember the specific moment when it happened. I suddenly felt compelled to raise a flag outside our home. The problem was I had not gotten around to purchasing one. No problem, I’ll just go pick one up. I went to the closest store I thought would carry American flags – Kmart. I walked the aisles looking for the flag section. Nothing. Finally I asked an employee. He looked at me like I had two heads and said they only carry flags around the fourth of July. Really? That seemed rather disappointing given everything that had happened today. On to my next stop. HomeDepot. Surely this hearty American store would have something. Again I walked the aisles. Nothing. I found a salesperson and asked for some help locating the flags. To my dismay I got the same response I received in Kmart. They only carry flags in June and July. This was going to be harder than I hoped. Next I stopped into several pharmacies as they seem to carry a little bit of everything these days. Nothing. I didn’t even bother to ask after I walked the aisles. It was getting late. Stores were closed or closing very soon. I needed to get a flag. I needed to find one soon. I remembered there was another store down the road that would still be open. I headed that direction. The number of cars in the parking lot signaled I had made it before closing. This American institution must have something with the Stars and Stripes emblazoned on it. Instead of aimlessly walking the aisles I decide to ask for help right off the bat. This time the response to my flag request was yes! I was told the aisle and I headed straight there. Sure enough, there was a rack full of flags. It was the first time I had smiled all day. Thank you Walmart. I grabbed the largest one they had and brought it to the checkout line, paid and headed home. I immediately hung it on the railing of our deck. I didn’t manage to find a pole to go with the flag so this would have to do. It was a simple thing to do, but somehow it made me feel a little better. We still didn’t know much about what had happened but I felt like as long we could still fly American flags somehow, somehow, we would all get through this. I knew things would never be the same, but we would get through this. Ten years later. Ryan is 11 going on 16. Connor is 7 going on 11. The boys are old enough to have heard about 9/11 but neither really understands it. I can’t say that I do either. Today seemed like a good day to tell them a little bit more about it. What can you tell kids though? How about my flag? 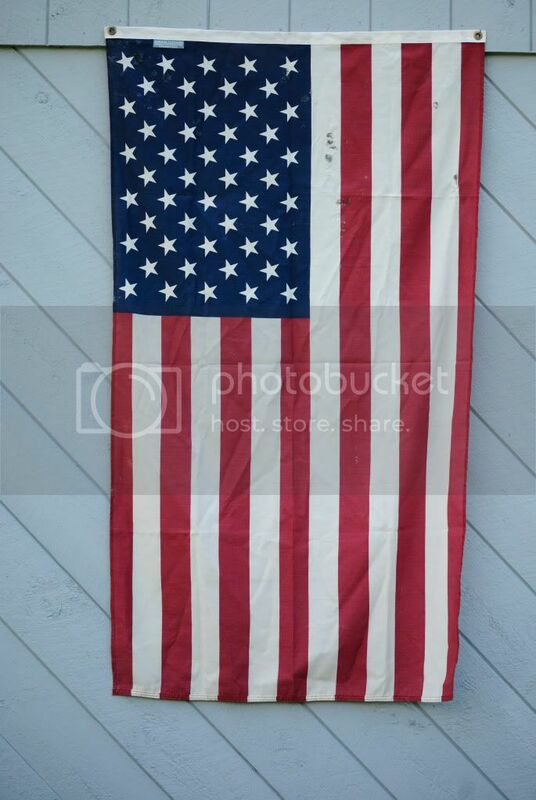 I still have that flag I looked so hard for on 9/11. I stopped flying it years ago as it shows some wear – a few small holes and a couple of stains. As a Boy Scout I was taught to respect a flag and that you shouldn’t fly damaged ones so I had purchased a sturdier nylon replacement that I fly year round. My 9/11 flag has been tucked away in my garage for awhile and I haven’t really known what to do with it. I dug out the flag and asked the boys to help me with a project. They are always eager to help when tools are involved. A hammer, a couple of nails and small ladder was all I would need for today’s project. As I climbed the ladder and put the first nail in I told the boys the story of my 9/11 flag. It was a little cathartic. The flag was now flying again. It looks good on the side of our house. I think I’ll fly it again next year, and the year after that. I hope that anyone who sees it will forgive me for flying a flag with some holes in it. If they knew the story I bet they would. This entry was posted on September 11, 2011 by Kevin Bobbitt. It was filed under Other and was tagged with flag.